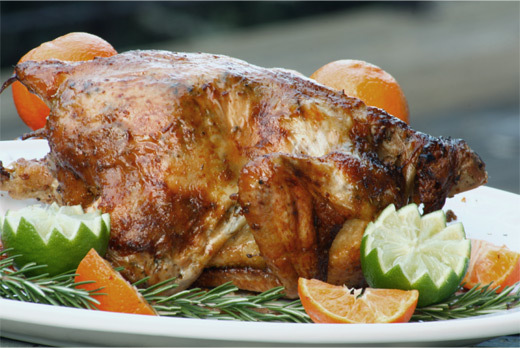 Roasting chicken is one of the best ways to showcase the poultry and enhance its flavor. It doesn't require too much skill; really, it’s just about a willingness to get your hands dirty. 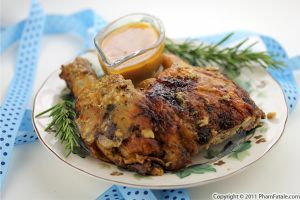 To ensure a tender and moist result, you’ll need to massage the marinade under and all over the skin of the meat. The flavorings for the marinade are up to you. All that matters is the inclusion of the tenderizing ingredients to ensure the meat is succulent. 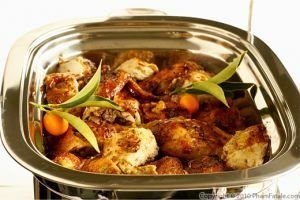 Over the years, I've come up with a great combination for a successful roasted chicken, which consists of softened butter or/and olive oil, baking powder, green papaya paste and an acidic ingredient such as lemon, lime (or any citrus) or vinegar. For the remaining ingredients, I chose, garlic, freshly grated ginger, mint, coriander and honey. 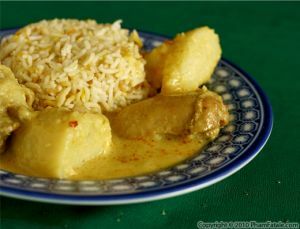 I also prepared a lime coconut sauce to pair with the chicken. And it was delicious! In a mortar and pestle, grind the peppercorns. Add ginger, ground coriander, dried mint, red chili powder and 3 tablespoons of butter. Mix until well combined. Zest both limes and juice 1 lime. Cut the lime into quarters. Clean the chicken thoroughly. Get rid of the fat chunks near the bottom of the chicken. Leave the skin on. Pat the chicken dry with a paper towel. Season the chicken with 2 teaspoons of kosher salt. Mix the garlic, papaya paste, 1 tablespoon honey, lime juice, lime zest and baking powder; be sure they're well incorporated. Place the whole chicken on a large tray. Wearing gloves, carefully separate the skin from the flesh without tearing it. 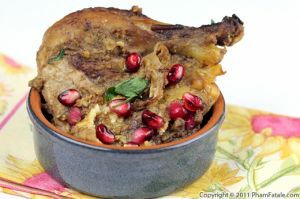 Spread all the mixture under the skin, in the cavity and on the outside of the bird. Rub evenly. Drizzle with about 1 tablespoon of melted butter. Marinate in the refrigerator for at least 2 hours, preferably overnight. 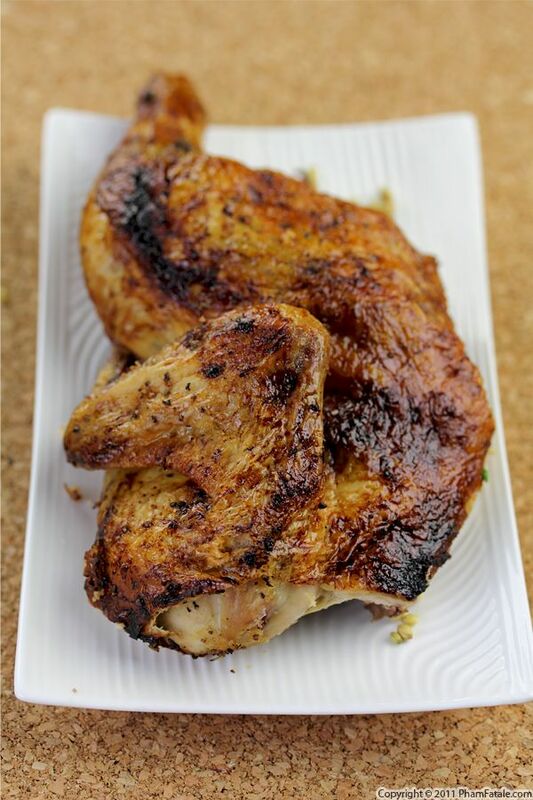 You can marinate the bird up to 2 nights. Place the quartered lime and green onions in the cavity of the chicken. Place the chicken in a roaster. Drizzle with a tablespoon of melted butter, then sprinkle with a little salt. Cover just the tip of the wings, neck part and shoulders with foil so that they don't burn. Add coconut soda to the bottom of the roaster. In the microwave, melt 1 tablespoon butter. Add 1 tablespoon honey. Baste the bird with the butter mix using a silicone brush. Increase the temperature to 400°F for roast for 15 more minutes to brown the chicken. Reserve drippings at the bottom of the roaster, discarding as much oil (fat) as possible and add them to the lime coconut sauce (recipe follows). Decorate with coriander seeds. I use French, Vietnamese and Indian (citrus, baking powder, papaya paste) meat tenderizers to ensure juicy and moist poultry. Little reminder on how to make papaya paste: Peel a green papaya. Grind the cubed papaya with seeds in a blender, place about 1 tablespoon of papaya paste per slot in an ice-cube tray and freeze them. Transfer the ice-cubes 3 by 3 into sealable plastic bags and place back in the freezer. For the lime coconut sauce: In a bowl, combine ¼ cup fromage blanc, 2 tablespoons peanut butter, the juice of half a lime, 1 teaspoon lime zest, salt and pepper. Smooth the sauce by adding a little coconut milk, depending on the consistency you like. Mix well. Published By: Jacqueline Pham on March 19, 2012.